How quickly can restaurants achieve a return on investment with digital menu boards? The answer is in this report. 22 pages of in-depth research, with real-world numbers from successful deployments at McDonald’s, Burger King and other operators. 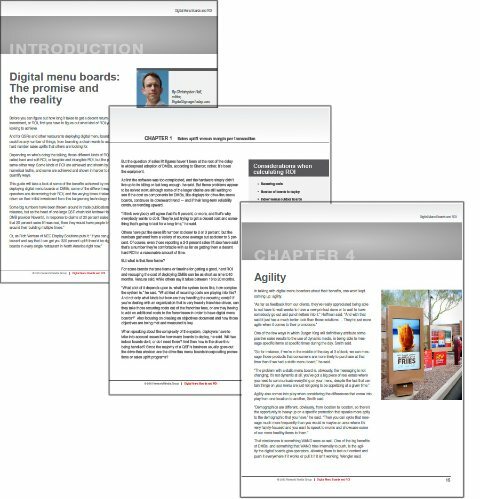 If you’re looking to understand the business case for digital signage in restaurants, look no further. In “Digital Menu Boards and ROI,” the staff of Digital Signage Today digs deep into real-world deployments to find out how quickly restaurants can expect to recoup their investment – and benefit from both hard and soft profits going forward. What is the “magic number” – the percentage of influence digital signage has on restaurant sales? What is the break-even point for digital menu boards? Find out in this report.